With a large range of antique paintings on offer to all clients in the area, you can guarantee to find the star piece of artwork you have been looking for, here with Stephen Cohu Antiques. As well as antique paintings I provide enthusiasts and antique dealers with furniture, pictures, objects d'art and other items so get in touch to find out more. At the moment we have a few spectacular antique paintings that are sure to be snapped up by keen antique collectors or dealers in the area of . 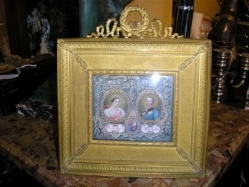 Our favourite piece is the fine portrait of Queen Victoria and Prince Albert from mid 19th Century. This piece is in a contemporary gilt metal frame but still holds its true characteristics of being antique. The piece even has signatures on the back and the remains of a wax seal that really make this antique one to be proud of. Other antique paintings over the years have included 1920 posters, art deco pieces and bespoke one off paintings that are hard to come by. The shop itself stocks a wide range of antique paintings, furniture, jewellery pieces and more so that you can come and explore the shop and we guarantee you will never be stuck for choice. To see pieces that are similar to this one or to enquire about a specific piece you have in mind, get in touch by calling us on 01534 485 177. Although we are closed Mondays, Tuesdays and Sundays, we are open every other day of the week 10am - 5pm, so that you can call and arrange a time to discuss antique paintings even further.